—Stephen Pratt – Know Your Liberty lecture series. “This is one of those booklets that I didn’t want to set down—Even after I had read it several times. A real gem. I majored in political science in College, with an emphasis on American political thought and the U.S. Constitution, and taught the Constitution to high school students. Furthermore I studied the Constitution and constitutional principles for over thirty five years. So I thought I knew all about how the Original Electoral College operated—Boy was I wrong. I thought the Electoral College was primarily a candidate selection process. But Gary and Carolyn Alder explain in this short booklet how the Electoral College was a three step process involving nomination, candidate selection and a final vote. This process of nomination, candidate selection, and final vote is explored in detail. Finally, the authors discuss the history of how the Electoral College was undermined, and how our modern political parties and our current flawed Presidential election process came into being. “Your understanding of the original electoral college is the same as mine. …Madison assumed that presidential elections would end up in the House of Representatives ‘nineteen out of twenty times’ – just what you say on page 33. The United States Has Two Constitutions. The Evolution and Destruction of the Original Electoral College is an in-depth analysis of how we should elect our Presidents. The Framers of our Constitution believed that the President should represent the nation as a whole in unity. This is the purpose of the Electoral College. This body of electors was intended to balance the need for national unity while protecting the sovereignty of the state governments. Unfortunately, the Electoral College is increasingly under attack by misguided Americans who fail to understand that in our Constitution the state governments have a vital role in our government. I highly recommend this book by Gary and Carolyn Alder. 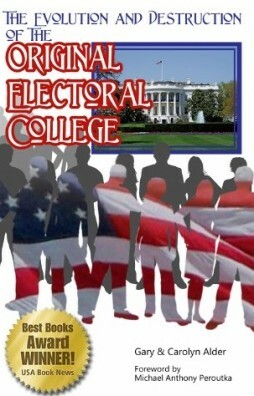 It is filled with valuable information concerning the proper role of the Electoral College, the best kept secret in American politics today. “Thank you for all the well-researched evidence, inspired insight and wisdom packed into your pamphlet, The Evolution and Destruction of the Original Electoral College. I very much appreciate the opportunity you’ve given me to read it. Knowledge of the truth is the medicine my spirit needs to heal the devastating effects of historical deception and confusion. I feel much better already!